After a five month hiatus I decided it was time to get back to writing. I decided to take a few months off to spend more time with the kids, focus more on my work and to volunteer at their school. There is only so much time in the day and unfortunately blogging was what needed to be put on the back burner for a while. Now that I feel like I’m back in control of my schedule and things don’t feel so chaotic I would like to share one of my favourite projects that we have done in our house. When we first looked at this house I was thrilled that it had a powder room. It was small only 3 feet by 6 feet, and dark but with a toddler I was trying to potty train I didn’t care about the aesthetics, I cared that I didn’t have to run upstairs every time Callum said he had to pee. Over the years I have tried to brighten it up. I painted it a cheerful yellow but the room still felt unfinished and every time I looked at it I knew more needed to be done to make it feel as finished as the rest of our home. It sounds funny that I was so embarrassed about the state of the powder room. I mean who cares right? It’s just a place where people go to do their business. Well for some reason I super cared. Ask Chris. He endured months of harassment. Many hours of “so when do you think you want to start the powder room?”. A big thanks to him for putting up with my nagging and for doing such a great job! My step mom Nancy also deserves a shout out. Without her I would still be trying to figure out how to hang wall paper and would most likely be covered in paste and crying in frustration. 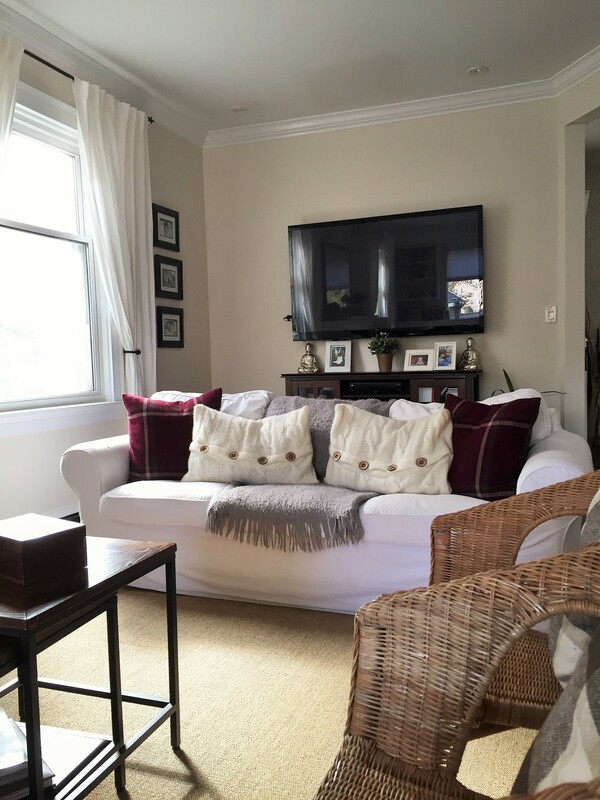 I didn’t want to knock down walls or rip up flooring for a few reasons, cost and there is no way to make the room any bigger unless I took out part of my kitchen or moved the basement stairs. We kept the current vanity, sink, light fixture and toilet but added in some bead board and wall paper. Both are from Home Depot. The whole room feels bigger and brighter. We also took out the medicine cabinet. It was a junk magnet and looked cheap so it had to go. We replaced it with some reclaimed wood shelving. I also added in a new mirror and pictures. Although the mirror is small it seems bigger because the frame is also mirror. The mirror is from Homesense. This is our old mirror. Isn’t it hideous?! New one is much better. We had to live without a toilet for a few hours. The kids were not impressed. Going upstairs to use the bathroom is apparently a lot of work. The pictures are from indigo.ca. I knew I wanted something floral and the simplicity and muted colours are a perfect compliment to the room. Now when I look at the powder room I smile. I don’t feel like I need to close the door so people won’t see how awful it looks. Our main floor is complete! Or is it? I’m sure I have another project up my sleeves. My kids love advent calendars! I can’t say I blame them. Waking up and getting chocolate first thing in the morning every day for 24 days is a pretty good deal. There is just one problem. I can’t stand having them on the counter every day so I put them in a drawer. After a week or so the advent calendars are forgotten about and are usually not discovered again until mid January. In an effort to keep the counter uncluttered and keep the kids plied with candy I decided to make my own advent pouches that can hang on the kid’s tree. Yes the kids have their own tree. This way they can hang up all their ornaments in whatever crazy way they want and I won’t be wincing or developing chest pains watching them decorate the big tree. It’s a win/ win for all. These pouches could not be any easier. All you need is some felt, scissors, hot glue, stencils, paint and some string. I used pinking shears to cut strips of felt 2 inches wide by 4 inches in length. Run a strip of hot glue on each side of the strip. Don’t go all the way to the top. You need to leave a bit of room for the string. Fold in half. The paint and stencils I used are from Martha Stewart and are available at Michaels. I used gold paint for an extra festive look but you can use whatever colour you like. Stencil on your numbers and let dry for a few minutes. Fold back the top of the pouch and hot glue your string in place. I used Jute twine because it is what I had on hand. I cut the string into 2 inch pieces. I filled the pouches with Hershey Kisses, tootsie rolls and caramels. The kids are already so excited to open them and I know they won’t get forgotten about after a few days. In my last post I talked about staging the mantle. I gave you a few pieces from Chapters that I thought would be great for fall and winter and could easily be used during the holiday season. As much as I love both of these I can not justify paying $49 for the antler and $39 for the sphere. So I decided to make my own with the help of a tree branch, some clay, electrical tape and gold spray paint. Sounds like a weird combination I know but just trust me on this. I started out with a thin tree branch to act as a guide for how I wanted the antlers to look and to also give it some structural integrity. I cut the small shoots off the branch and taped them back on where I thought it would look the most “antlerish”. Then I started to put the clay on. I just wrapped it around the branch and with damp hands I smoothed out the seams as best as I could. To make it even smoother I used one of my cake decorating tools. I let it dry over night. As you can see I propped it up in a few places just to make sure the weight wouldn’t cause the clay to split apart. After it was all dry I sanded it smooth with a fine grit sandpaper. Brush off the excess dust. There will be a lot of it! I used Krylon gold paint for two reasons 1. Because it gives more of a matte finish as opposed to a really shiny metallic finish and 2. I already had it at my house. After the paint was dry I smeared on some walnut stain that I had lying around the house. Wipe it off immediately because it starts to get sticky if you leave it on too long. The sphere was made from small dowels and left over clay. It took about a minute to do. Just make a ball out of your clay and start putting the dowels in all over. When it was dry I used the same Krylon paint. Are they as perfect as the ones from Chapters? Oh my heavens no, but they do look nice and they add a certain rustic charm to the room. Not bad for 30 minutes of work and $5! How are you decorating your mantle during the fall/winter season? I have always found that it is really easy to stage your home in the summer. 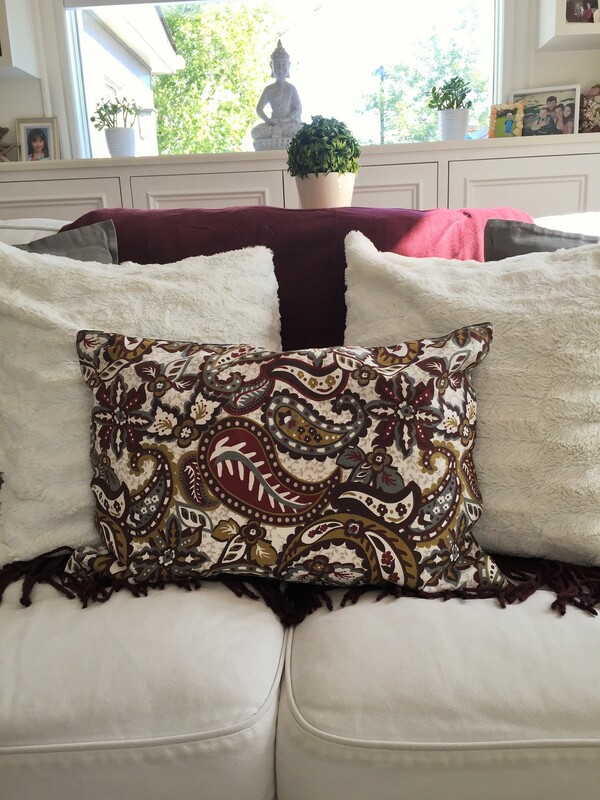 After you clean the house you can add in a few fun and colourful throw pillows, open the windows to let in the natural light and your home is ready to show. Fall and winter are a bit different. Especially before and after the holidays. How can you make your home look warm and inviting without breaking the bank? 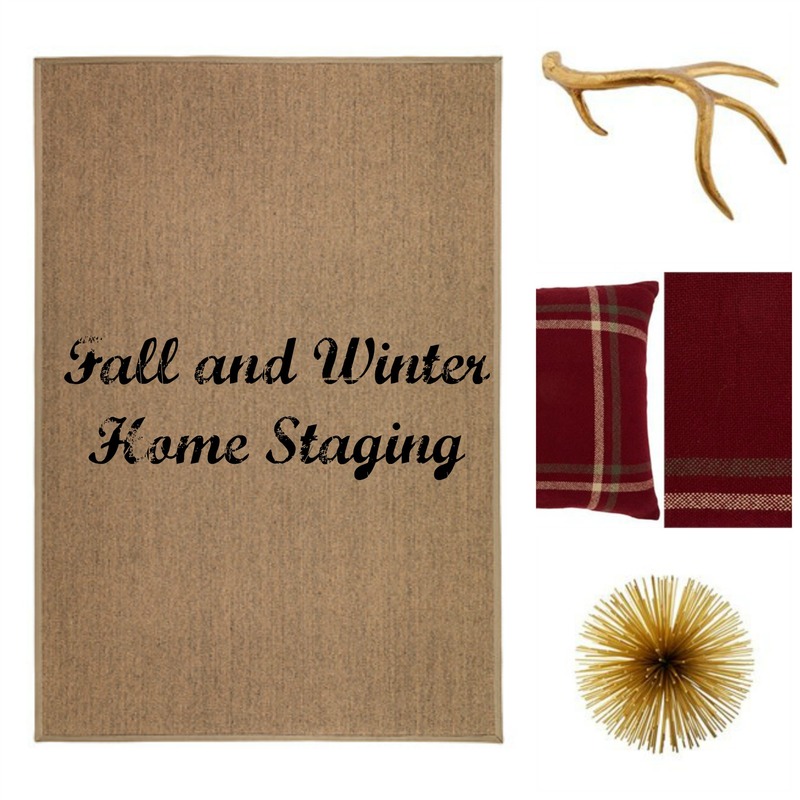 With a few key pieces you can go from fall to winter without having to worry about things clashing with your holiday decorations or making the house seem cluttered. My first piece of advice when staging is always get an area rug. They help to define the space and makes the room look complete and put together. 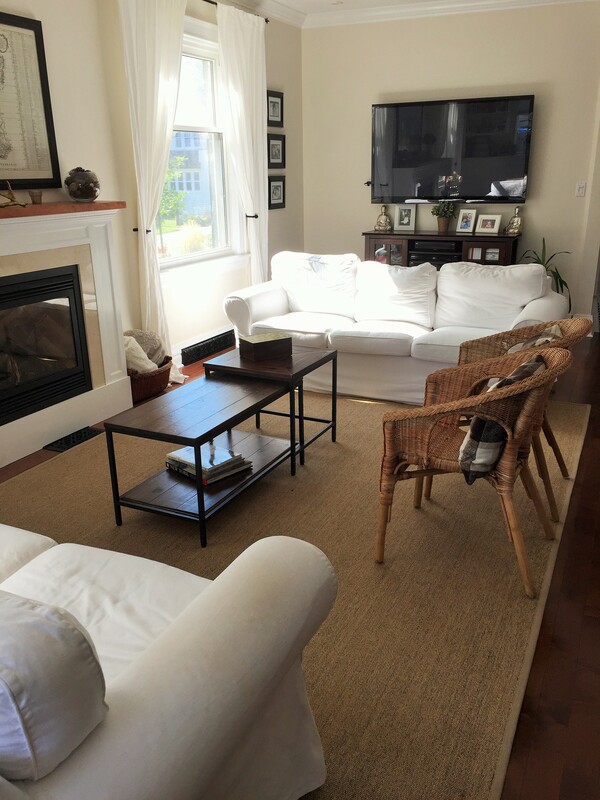 Take a look at this space before staging. It’s okay, but a bit bland and because of the length of the room the furniture looks awkward placed the way it is. The space is instantly defined. You can clearly see where the seating area is and the furniture no longer looks like it was randomly placed. Anyone that has been in my home knows how much I love throw pillows. I change them all the time depending on the season. 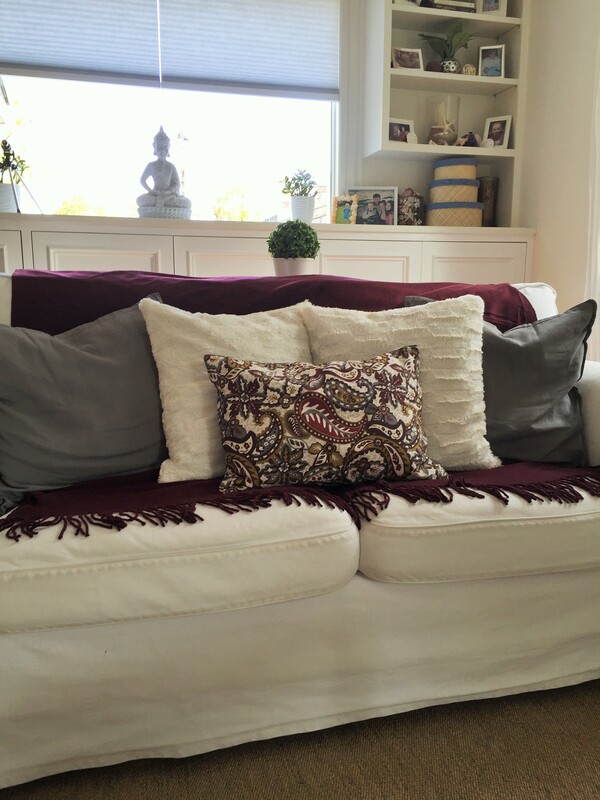 Throw pillows and blankets are an inexpensive and easy way to add colour and coziness to a room. At $9.99 and $4.99 they are too cheap to pass up and they come in a multitude of colours. I added in a grey throw, pillows I got at Ikea last year and a pillow I made out of a double sided place mat. I just split the seam on one end, threw in a pillow and sewed it back up. Not bad for a $2 place mat! 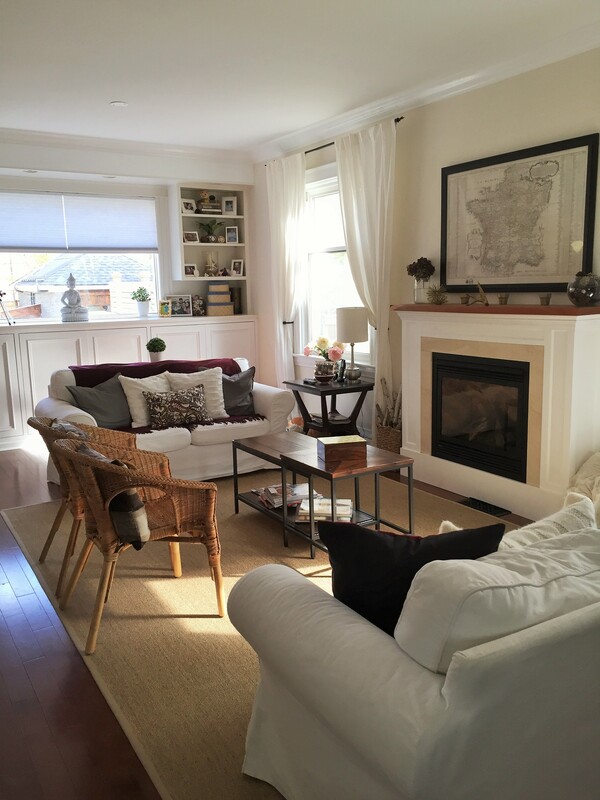 With a few accessories this room now looks cozy, defined and ready to show. I am a huge fan of gold right now and these pieces that I found at Indigo are perfect for fall and winter decorating. In an upcoming post I will show you how I created my own version of these pieces. If you have a fireplace in your home that is functional make sure that you turn it on before a showing. Nothing says warm and inviting quite like a glowing fireplace. So there you have it. With a few quick and inexpensive pieces your home can go from bland and cold to warm and inviting in just a few minutes. Much like jewelry can make an outfit, a few home accessories can make a room shine too. I swear the last two weeks have just flown by. I had so many plans to sit down and blog but they never came to fruition. Callum had surgery right after Thanksgiving and in my mind I really believed that he would come home from the hospital and be right as rain within a few days. 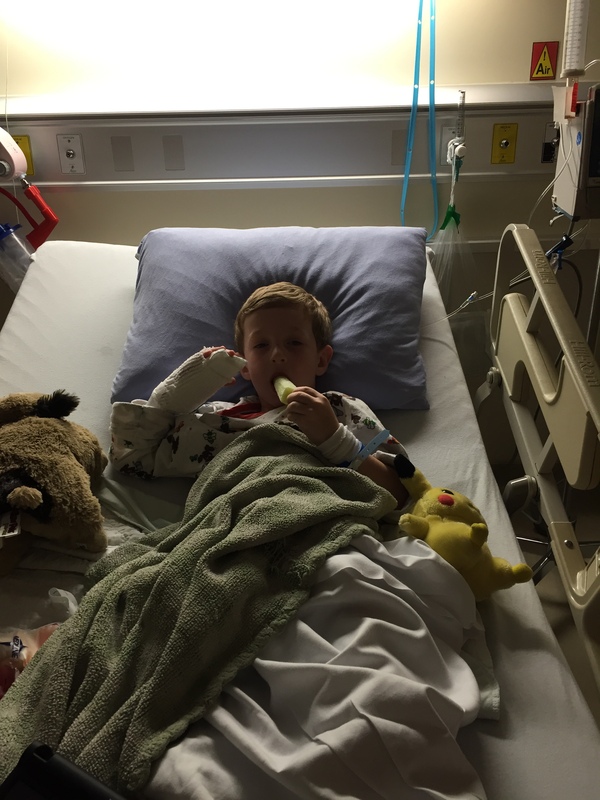 Turns out kidney surgery takes quite the toll and turns sweet little boys into tiny little dictators. That was the first thing he said to me that morning. No please. No thank you. Just demands. Needless to say I haven’t slept very much and I have been run off my feet trying to keep the little dude happy, this house in some state of order, and trying to work. Callum is feeling much better now so to celebrate we decided to craft. 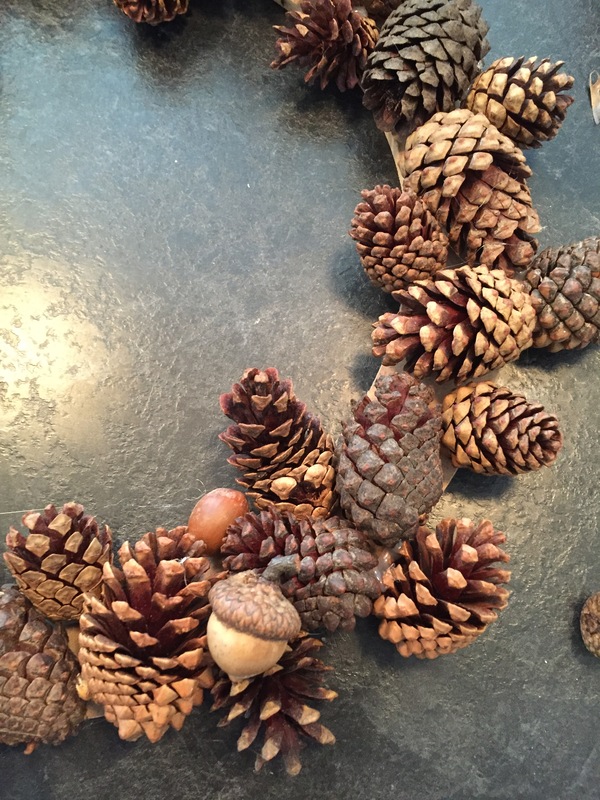 He wanted to build a tall acorn tower and I wanted to make a wreath. 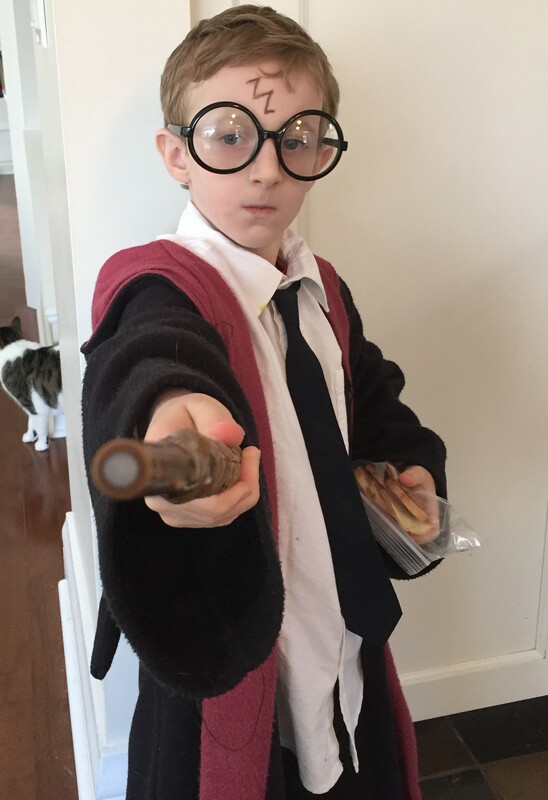 We compromised and he got to dress up as Harry Potter while helping me decide where to put the acorns and pinecones. 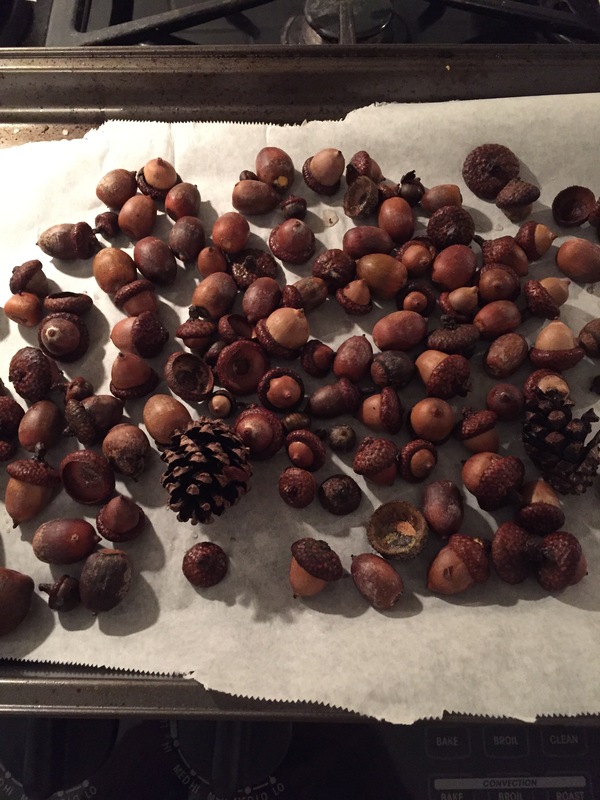 Callum and I found all the acorns and some of the pinecones in a forest near our house. I rinsed them off and put them on a baking sheet and tossed them in the oven at 200 degrees for two hours. I am so happy I did this because I found a creepy little worm crawling out of an acorn and the heat kills all those icky little creatures. 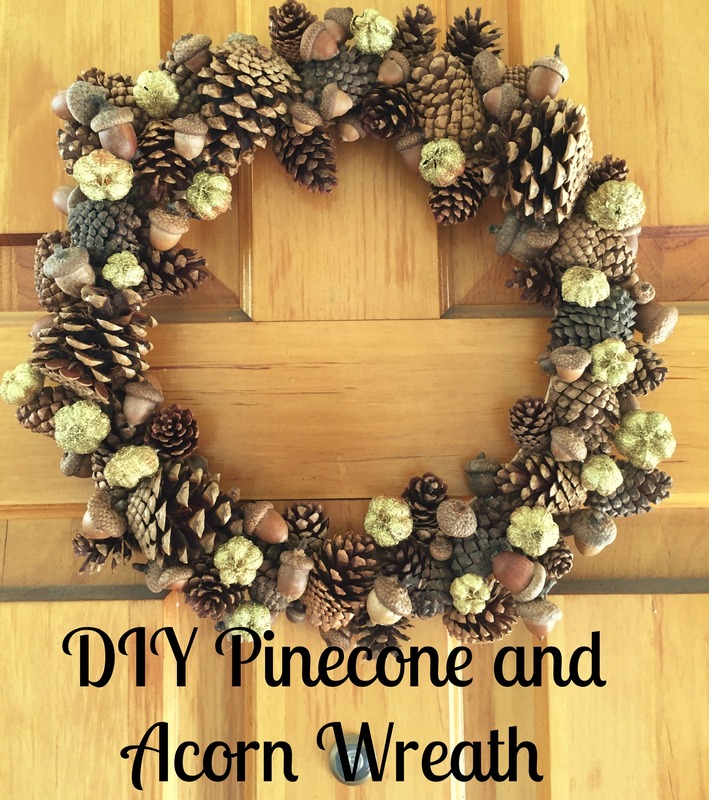 After everything is dry and bug free you can start to hot glue the pinecones to the wreath form. 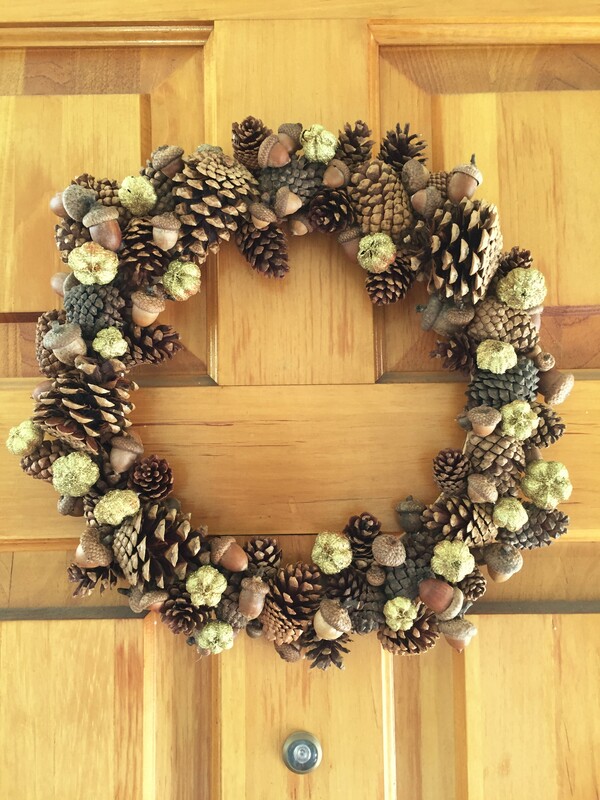 You can use a foam wreath, grapevine or wooden like I did. I just happened to have a spare wooden wreath form so that’s what I used. Don’t forget to attach a piece of wire to the wreath so you can hang it. 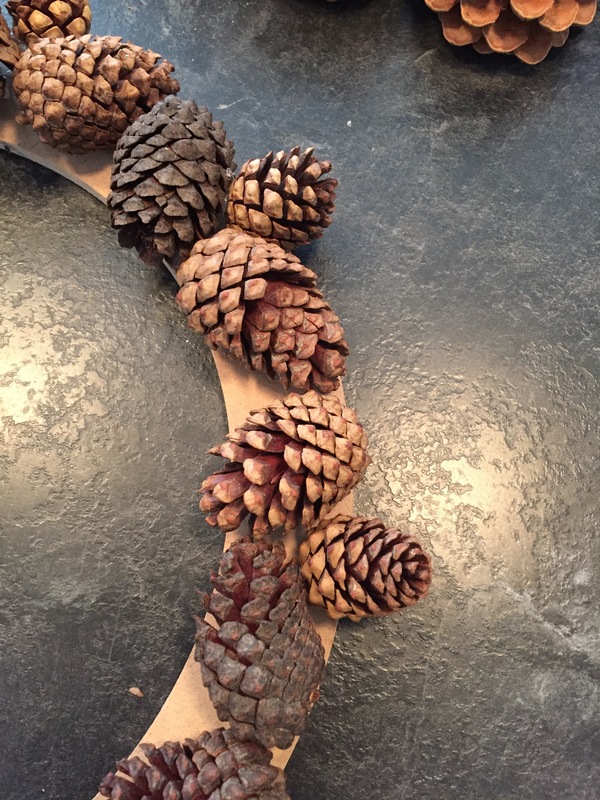 After the initial pinecones have been glued on you can start to fill in the gaps with smaller pinecones and some of the acorns. Keep piling them on until you are satisfied with how it looks. I bought the small pinecones at Michaels. 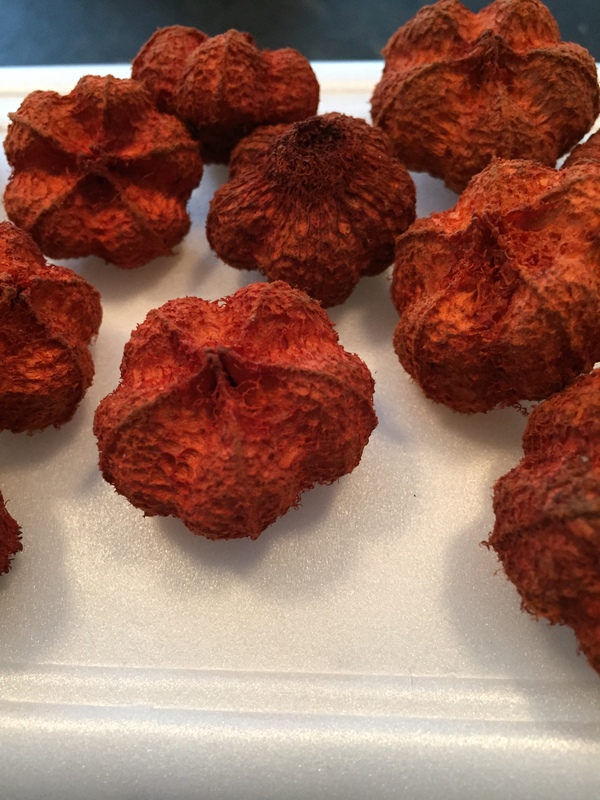 They came with these little orange pods. They are perfect for fall but I want to use the wreath in the winter too so I decided to spray paint them gold and while they were wet I sprinkled on a little bit of gold glitter. I gotta say I am pretty happy with it. It is perfect for fall and winter. 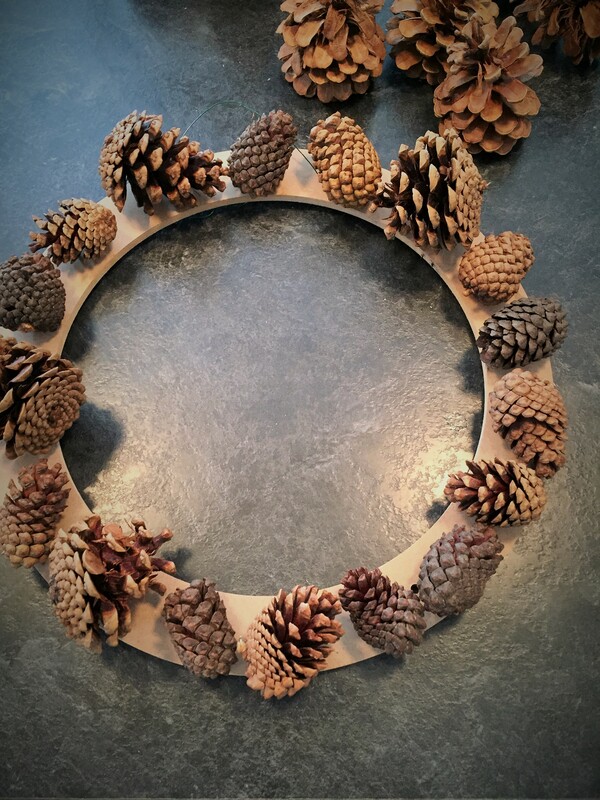 It took about half an hour to glue everything on and it was basically free because I only had to buy a few pinecones, and as everyone knows free is my favourite.